I am a member of the AAGSAR Genealogy Group. As a member I was asked to choose an ancestor that I wanted to know more about for my challenge. So here she is! Miss Sarah DOYLE. My 2x Great Grandmother. To find the Slave owner of Sarah Doyle, how he obtained her and her death date. Challenge: To determine who the slave owner(s) of Sarah Doyle was, how he obtained her and her family and find out when she died. She was born in Virginia abt 1840, d. sometime between 1886-1892. No records other that the 1870 & 1880 census have been found for her. Interviews with descendants say that Sarah Doyle is buried in the DOYLE family cemetery (heavily wooded) in Gretna,Va. I have mostly oral family history, stories passed on from her children and grandchildren. Others: Possible slave owners Burwell LEE, Robert Austin LEE, Gen.Robert E. LEE, Mildred Dillard DOYLE LEE, John LEE of Rockbridge, Va. Tribe (s): Virginia- Pittsylvania and Campbell counties. 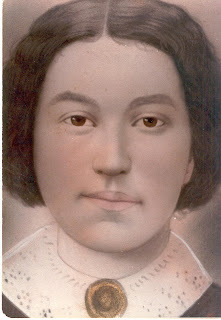 Summary: Sarah is found on the1870 & 1880 U.S. Federal Census in Pittsylvania County, VA. She is shown living on the plantation/Farm of Burwell Lee along with her parents, Peter and Eliza Doyle, her siblings and children; Parris, Emerson, Mildred, Eliza, Peter, Mary Elizabeth and Mattie ( b. 1879 had a different father). The fact that Sarah is shown living next to Burwell Lee in the 1870 census leads me to believe that he is the probable slave owner. The 1860 census slave schedule shows that Burwell Lee did own two mulatto slaves fitting the description of Sarah and her oldest son Parris. (B.abt 1858). The 1850 census Slave schedule, Burwell is not shown owning a mulatto slave fitting Sarah's description. The 1860 census for General Robert E. LEE does not show him owning slaves fitting their description. On the marriage record of Sarah’s daughter Mary Elizabeth (b. 1870) to her second husband William Toler in 1904, although misspelled, she lists her father as Burwell LEE. Mildred Dillard Doyle, married John Doyle of Rockbridge in Sept. 1854 in Pittsylvania Co.Va. Since Mildred was referred to as the Widow Mildred D. Doyle, I assume that John Doyle died. She married Burwell Lee in 1857 also in Pittsylvania County. Burwell was a wealthy tobacco farmer. He owned the town of Leesville, Va and later became the Justice of the peace. 1. When did Sarah die? 2. Were Eliza and Peter Doyle really her parents? 3. Was Burwell LEE her owner? If so, how and where did he obtain her? 4. Was Sarah owned by Mildred Dillard Doyle LEE prior to her marriage to Burwell in 1857? 5. Was Sarah owned by John Doyle? Mildred’s previous husband. 6. Was Sarah a gift to John Doyle and Mildred when they married in Virginia in 1854? 7. Was Sarah and her family given as a wedding gift to Burwell’s son, Robert Austin LEE ? Research family records of Burwell LEE family, Deeds, Wills..